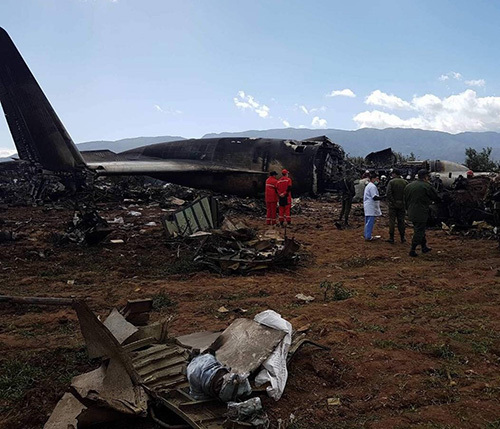 More than 250 people were killed when a military plane crashed in a field outside Algeria’s capital on Wednesday, state media said, in the country’s worst air disaster. A military source said there were no survivors. The authorities are working to identify remains of those killed. The crash occurred in Boufarik, a town in Blida Province, approximately 30 kilometers from the capital Algiers. The Soviet-designed Il-76 military transport plane was travelling to Bechar and Tindouf in the south-west of the country but crashed on the airport’s perimeter, Algeria’s Defense Ministry said. The Tindouf region, which borders Western Sahara, is home to refugee camps and serves as a base for the Polisario Front. A member of Algeria’s ruling FLN party told the private Ennahar TV station the dead included 26 members of Polisario, an Algerian-backed group fighting for the independence of neighboring Western Sahara - a territory also claimed by Morocco in a long-running dispute. Dozens of firefighters and rescuers worked around the smouldering wreckage. One eyewitness told local television: “We saw bodies burned. It is a real disaster”. An inquiry is under way into the cause of the crash. Algeria President Abdelaziz Bouteflika declared three days of national mourning and prayers for the dead on Friday. Wednesday’s plane crash is the deadliest in the world since July 2014, when all 298 people on board Malaysian Airlines flight MH17 died when it was shot down over eastern Ukraine.